Adventures In Uglyworld: Uglyworld #719 - I Is Not Duck Foods! Uglyworld #719 - I Is Not Duck Foods!, originally uploaded by www.bazpics.com. Babo asked Turtle if it would be possible for us to visit some waterfalls during our daytrip to Mount Adams, so Turtle modified his original plan to include 4 waterfalls, including Dougan Falls which ended up being the first stop of the day to catch the early morning light. 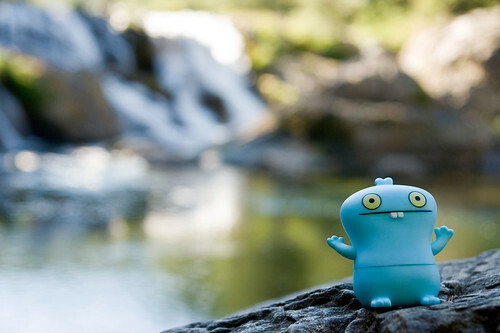 After helping Babo, Turtle and the others down the wet and extremely slippery rocks we stood watching the waterfalls until a scream came from Babo followed by the frantic sound of his footsteps. A duck had seen him standing right on the edge of the water and obviously had thought he might make a tasty snack, no matter how loud Babo shouted, "I is not duck foods!!!". Thankfully Turtle came to the rescue and reassured the duck (Turtle can actually speak Duck as well as several other languages) that Babo was not in fact food, but a tourist visiting the waterfalls. After Babo calmed down again he fed the ducks some of his cookies as way of a peace-maker.